With the afternoon ahead of us we set off to explore, first heading to the plaza where we found an tourist information booth. It was immediately obvious that this town is much more touristy than anywhere else we had visited on the Oaxacan coast. Staying in centro we still had a lot of cheap restaurants as well as fruit and vegetable shops and small local businesses. Being high in tourism many people spoke some English so we had to be careful with what we would say in front of shop/restaurant owners or tour guides, and everyone was out to sell you something. Deciding to check out the bay we walked about 40 minutes along a busy main road leading to Santa Clara which is where the cruise ship dock, the marina and a small tourist beach was located as well as heaps of restaurants and fancy hotels. Hotels which can cost around the same amount per night as our weekly accommodation budget. 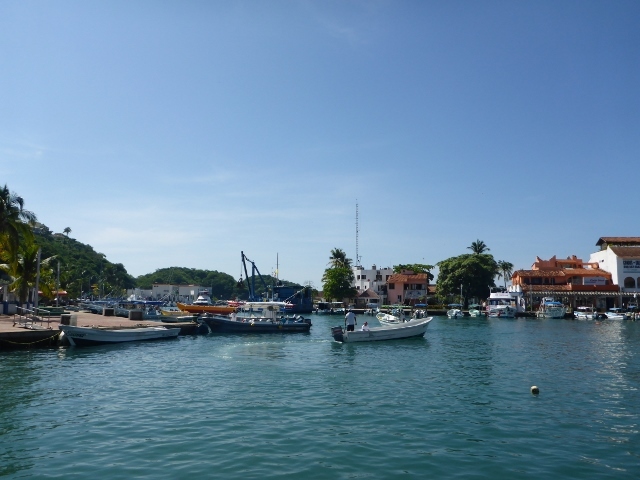 As soon as we arrived at the marina we got mobbed by guys trying to sell boat tours for seeing turtles and dolphins, snorkelling, fishing or the visiting the national park’s bays. We did want to go on one of the boats but we wanted to check out prices and options without getting roped into booking as we had only arrived an hour earlier. Wandering around for an hour we reached the end of our tolerance for people trying to flog tours and restaurants so decided to head back into town. We had received prices from 300 Peso each on a big launch to 1500 Peso for a private boat, the latter being far beyond what we wanted to pay. 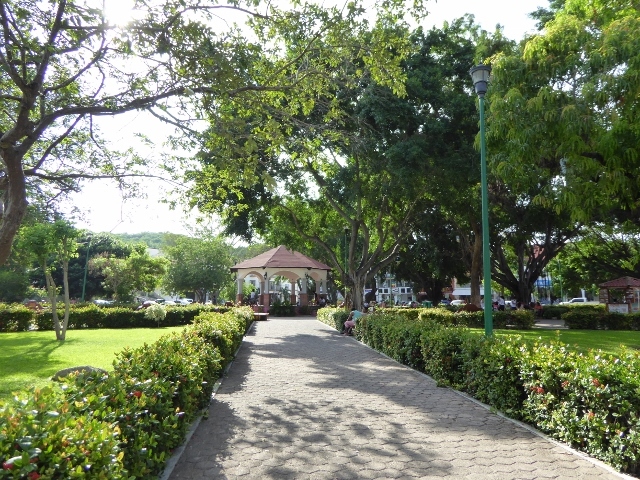 Back in centro we chilled out and pondered our options with a tasty ice cream in the plaza. I love the cheap 10 peso ice cream sold from carts in centro districts of towns and cities, there is just something so satisfying about them. Our favourite flavours we always seem to go back for are vanilla, coconut, cookie (me) and lemon (Tom). We had the beginnings of a plan in our head about what we wanted to do for the boat tour. Unfortunately the private one was well out of our price range because that would’ve been perfect. I hear you thinking “Why does she want to get back on a boat after being sea sick on the last one?”. 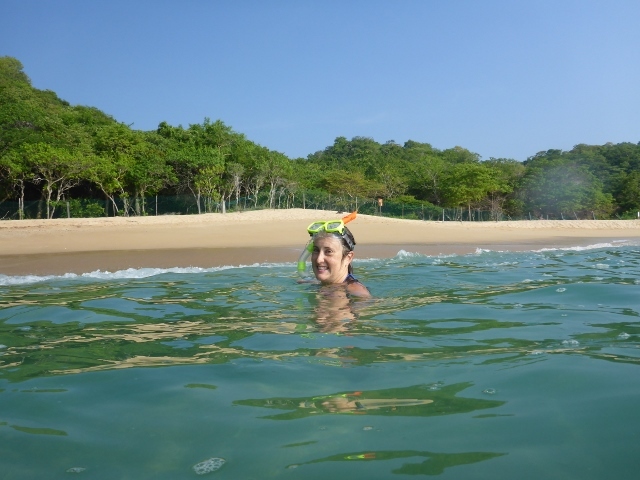 Because visiting the bays of the Bahia de Huatulco National Park is the best rated thing to do here and I couldn’t miss it. But this time I would go armed with motion sickness pills! The next morning with an incomplete day plan in our head we set out to find breakfast. Our plan for the tour options was to book one of the cheaper but larger launch tours which ended up at 300 peso each. This didn’t include the snorkel hire so we set off to find gear which would cost us less than the 130 peso each (rip off) that they would charge on-board the boat. At the market this was easily done and so with a snorkel and mask each for 100 peso we returned to the hotel and got ready to go to the beach. 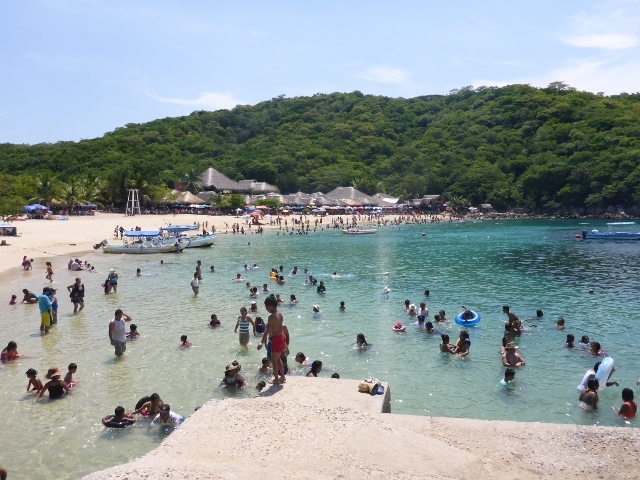 Playa la Entrega is the closest of the beaches around Huatulco and grabbing a taxi we weren’t sure what to expect. The beach turned out to be lovely; pretty, calm water in a bay which would be peaceful except for the throngs of tourists splashing around in the water and the tour boats. So we picked our way over some rocks and rounded the corner where we found a tiny but perfect bay. Donning our new snorkelling gear we headed out into beautifully warm water which we discovered was quite clear and perfect for snorkelling. Testing out our snorkels and masks in waist height water we found we weren’t alone in the water, there were lots of little 10cm long puffer fish cruising around. They are super cute and I spent a while chasing them around trying to catch one. There was more marine life to be found around the rocks at the edges of the bay and we happily explored for about two hours finding heaps of different fish including an eel or sea snake as well as some small bluespotted cornetfish (we needed to Google the name after finding them in a few locations). The snorkelling gear was a success. The next day was our tour and we grabbed some smoothies for a quick breakfast on the way to the meeting point. I was prepared with my travel sickness pills and determined not to get sick this time as there would be many more people on this tour to witness my shame. The marina was busy with lots of people waiting to board their tour boats. It was like a bus terminal or small airport. After waiting for our boat name to be called we boarded and luckily got side seats for the view. The boat set off slowly out of the harbour after insisting we all put on life-jackets, but by the end of the day no one was wearing theirs. The music was cranked up and staff came around with bottles of soft drink and cups. This would’ve been a great occasion for a small bottle of rum. First stop was a bay, I have unfortunately forgotten the name of, for some snorkelling. The staff came around collecting money for the use of their gear but we were already prepared with our own. They had a small boat ferrying people to the shore from where they could buy food, snorkel or play in the small waves. This was taking time so we got impatient and jumped off the boat to make our own way to the reef. I think we must have been a bit of a novelty; foreign tourists not using the life-jackets to snorkel. But as I said in my last post about Mazunte, with a mask and snorkel you can actually float quite easily so I never felt like I needed a life-jacket. We cruised around in the water for a while and were eventually joined by some of the other people on our tour around the reefs. The water was lovely and clear but some of the reefs were quite high so we needed to be careful not to lose skin on the rough surfaces. Towards the end of our hour in the bay we made our way back to the boat and arrived before the first group arrived back. 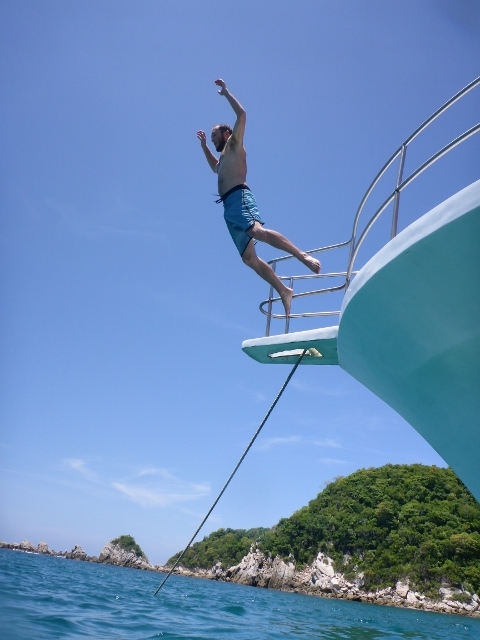 So with 15 minutes up our sleeve we asked if we were allowed to jump off the boat. Again I think we were considered the weird foreigners but we cared not a bit as we threw ourselves off the bow. Such fun! Our next stop was Playa San Augustin which was absolutely stunning, a perfect crescent of golden sand, blue water and a great reef. The water here was so clear I felt like I was flying above the fish and coral without water between us. Unfortunately our camera battery had died after our boat jumping so we have no photos. The main point of the boat stopping at this bay was so the passengers could go to shore and spend money in the overpriced seafood restaurants dotted along the shore, but again we were prepared and had snacks with us. 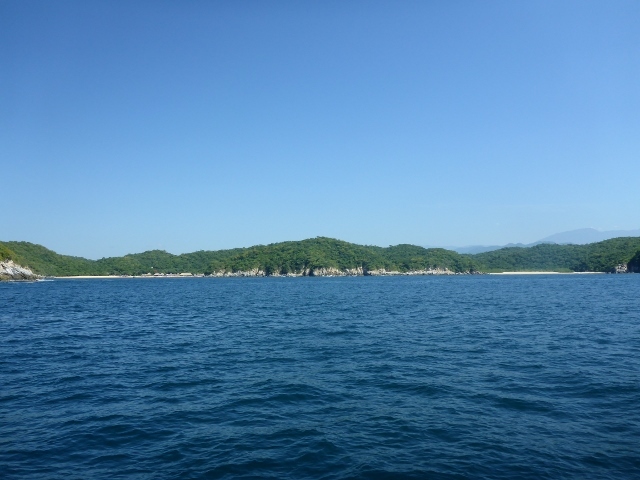 On our way back to Huatulco we went out into deeper water and were lucky to see more sea turtles (briefly as they are very shy) as well as dolphins and in the distance rays leaping out of the water. I had managed to make it through the whole trip without being seasick and only started feeling a tiny bit nauseous on the way back. After a day of sun, salt water and snorkelling we were worn out and had a quick and easy local dinner before crashing. After having a lazy start the next day we ate a buffet breakfast, which didn’t end up doing good things for our stomachs, before we decided on what to do for the day. 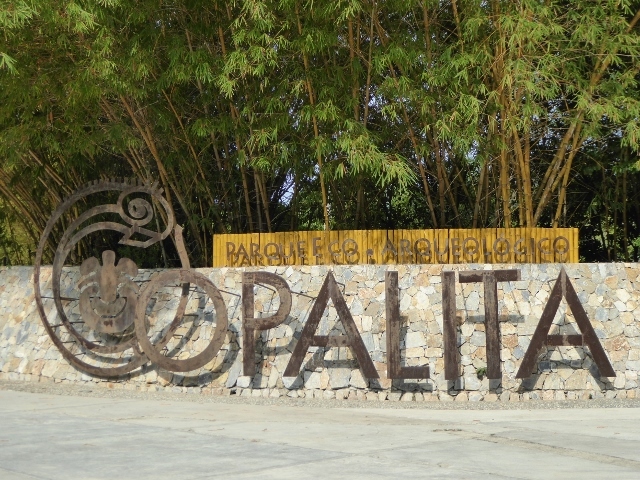 We took off for Copalita which is a small archaeological site nearby. The site was lovely and shaded in the heat of the afternoon. It turned out to be a really nice afternoon visiting the museum, walking through the forest, looking at the small amount of ruins, hiking up to the view points, looking up at the huge trees and searching for birds. We exited right on closing time and started walking the long distance back hoping a taxi would drive by shortly, otherwise it would be a long walk. Luckily we had only been walking for 5 minutes when and empty taxi came past which we madly flagged down. Our final day was a slightly crazy one with our check out time being 12 noon and our bus departing at 11pm. We woke up really early, throwing on our togs and sunscreen and running out the door around 7am. Our destination was another bay which we hadn’t visited yet called Playa Maguey. We were the first people on the beach, except for the restaurant staff, and we quickly walked away from their sales pitches to the opposite end of the bay. 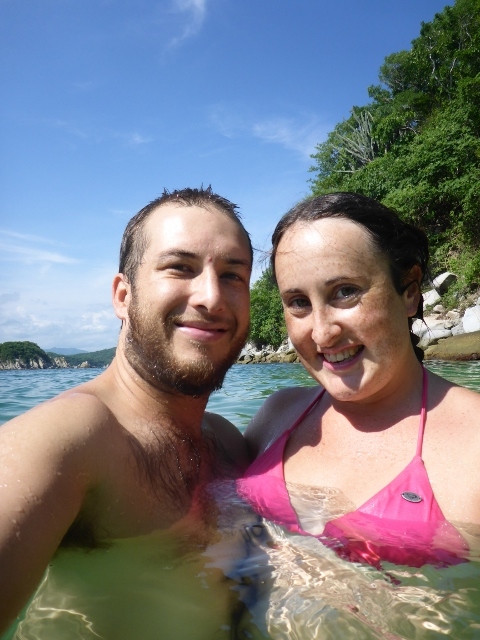 After eating a light breakfast of a muesli bar we ran into the water with our snorkel gear. The water was nice and cool at that time of morning and the side of the beach we were on was in full sunlight. Unfortunately after a few minutes we realised that the underwater visibility wasn’t was great as our previous snorkelling expeditions. We could see but the angle of the early morning sun and murkiness of the water made it difficult. We had about two hours at the beach before we needed to taxi back for showers before our check out time. So we made the most of it staying in the water as long as possible. Even though the visibility wasn’t great we were still able to see lots of fish, including some large schools, and coral. It was here that I managed to see the coolest fish I had seen so far. It was actually a variety I had already seen a few of, a bluespotted cornetfish, but this one was over meter long and appeared out of the gloom in front of me. It was a little scary to tell the truth and I didn’t want to get too close. After a while we went back to the shore and ate the remainder of our snacks while we dried off before walking back down the beach to locate a taxi. The taxis were easy to find as this was the time all the tourists were starting to turn up. The morning had been so nice having the beach to ourselves but we needed to get back, showered and packed before our check out time. In the afternoon we had originally thought we would go see a movie to absorb some our remaining time before the bus, but after arriving at the theatre we discovered that all the movies were dubbed in Spanish. Our Spanish is OK but we would still find listening and understanding movies quite difficult so we decided to skip the movie and headed back to our accommodation. We spent the day on the computers camped out on the rooftop terrace of the hotel as we could no longer use our room. We watched a movie, wasted time on the internet and read to get through the day. In between all this we also went out for a late lunch which we decided would be at a nearby cheap pizza restaurant. We ordered two chico (small) size. When they came out they were huge but we ate them all and they were delicious. The time crawled by but eventually it was time to grab our packs and go to the bus terminal. 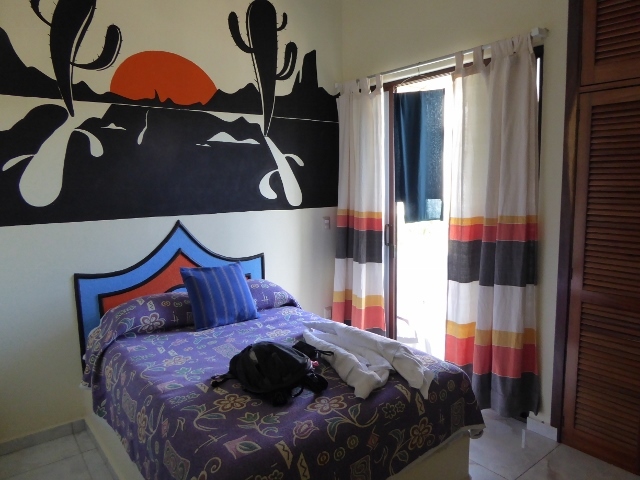 At least at that time of night we would hopefully be able to get straight to sleep on the bus, waking up inland at Tuxtla Gutierrez in central Chiapas. Time to say goodbye to Oaxaca and hello Chiapas. 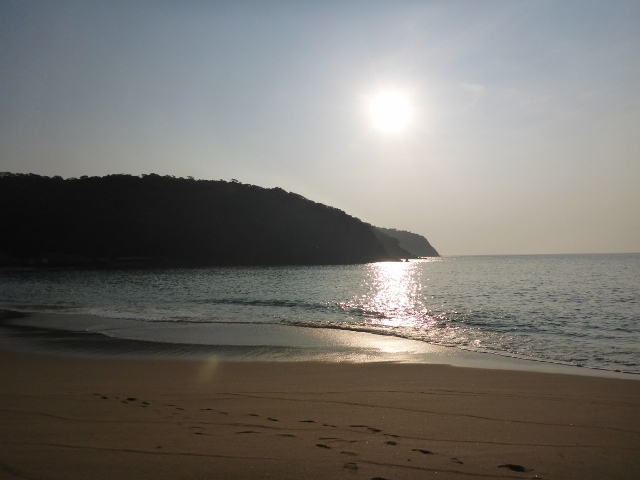 This entry was posted in Backpacking, Countries, Mexico, Travel and tagged Backpacking, Bahias de Huatulco, bays, Beach, boat, Coral, Fish, Huatulco, national park, Oaxaca, Pacific, parque nacional, Playa, Playa Entraga, Playa Maguey, Playa San Augustin, snorkel, snorkelling, tour by twostraykiwi. Bookmark the permalink.